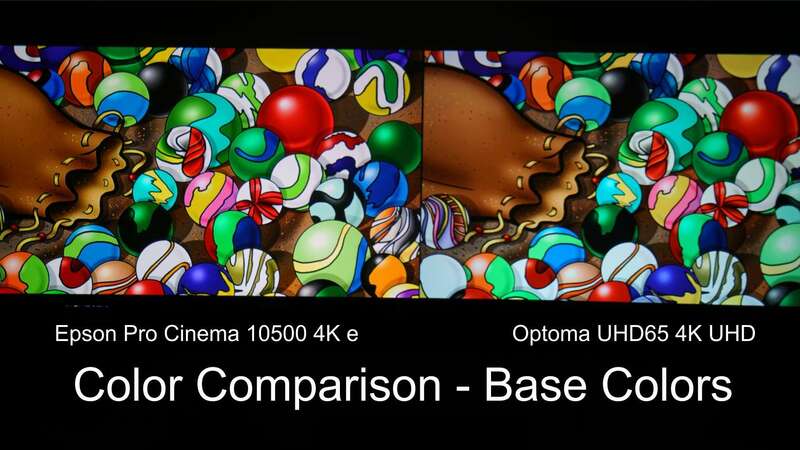 The comparison between the Optoma UHD65 and the Epson Pro Cinema LS10500 proved to be very interesting. The Epson Pro Cinema LS10500 uses three reflective LCD chips which, like the Sony, are known for their superior black levels (which are very desirable in a good home theater projector). Good blacks, or deep blacks, can result in very good contrast and can give more depth and help bring out details in the image. The question, then, would be how does the LS10500, with its excellent blacks and color and 4K e-shift, compare to the new Optoma with true UHD 4K? Weight: 39.7 lbs. 31 lbs. Similar to the other projector comparisons, we set both up with accurate pluge and white clipping levels, which we feel are essential to any projector comparison. In addition, we set to the manufacturer’s 6500K white balance so color would be as close as possible without having an extensive color calibration done on each. What we were interested in most is how they would compare essentially “out of the box” with simple basic adjustments anyone would be able to perform. The above off-screen image shows the proper white clip or highlight detail setting. The white-on-white square is just visible to the eye. If you were to adjust the contrast any higher the white square disappears. What the camera could not pick up is that the pluge bars, the first two on each side of the grey scale squares, are both visible to the eye. If we adjust the iris of the camera to record the pluge settings, not only do we lose the white square, but almost all of the greyscale also disappears (see the Sony comparison). Below is what it should look to the eye (after adjusting your monitor) but it is hard to capture in the camera. To see the above adjusted correctly, adjust your contrast until the white square is just visible. Then adjust the brightness until two of the vertical bars on each side are visible and the outside bar (5) is just barely visible. 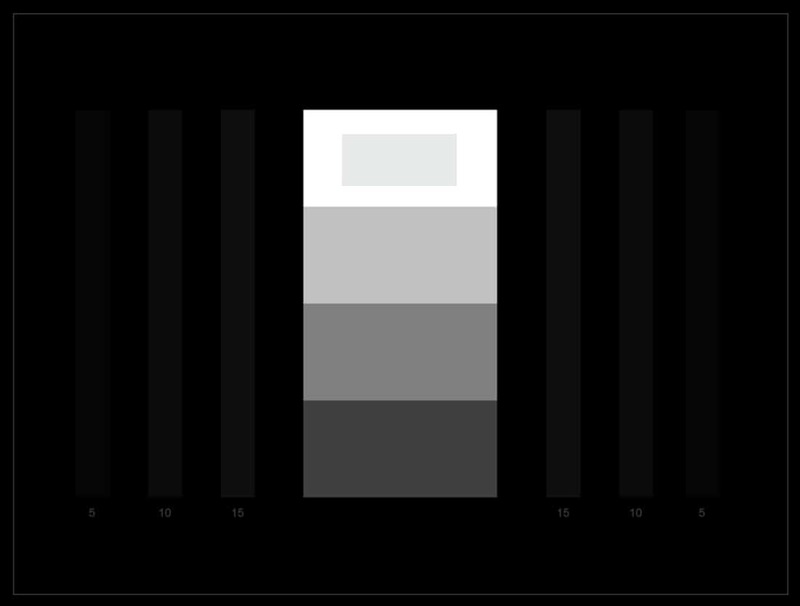 Using this kind of test signal will allow your display to give the best contrast without losing any detail. Next, we set the projector to 6500K color temperature, or white balance. 6500K gives the best balance of color and is the standard to which most content is produced. If the projector or display does not have 6500K setting, then middle or between cool and warm is usually best. Again, both projectors did a good job with color. The Optoma can hold its own with any three-chip projector. By using the RGB/RGB color wheel, Optoma is able to create very accurate color even though it is a single-chip system. Skin tone was excellent on both projectors. Out of the box the LS10500 was a little on the too-much-color side of things, but can be corrected by simply setting the color level down. The slight difference in skin tone below is because of the presets for 6500K and color levels were slightly different. Fortunately, both projectors offer have a full range of control for both simple and full technical calibration. Here is where the two projectors are very different: 4K detail. Both are great on full-HD, but where they really separate is on good quality, true 4K content. What we found was, at viewing distance, you can definitely see the difference in detail between 4K enhancement and true UHD 4K. It’s really the difference between 4 million pixels and 8 million pixels; full-HD is 2 million pixels. If you click on the image above, you might be able to see a slight difference in the deeper blacks of the Epson. The extra detail of 4 million more pixels on the Optoma is clearly visible in terms of more stars and fine detail. The highlights are also slightly better on the Optoma UHD654 on the right. The image above has been zoomed in to 1/4 of the full image to show the visible difference in detail. 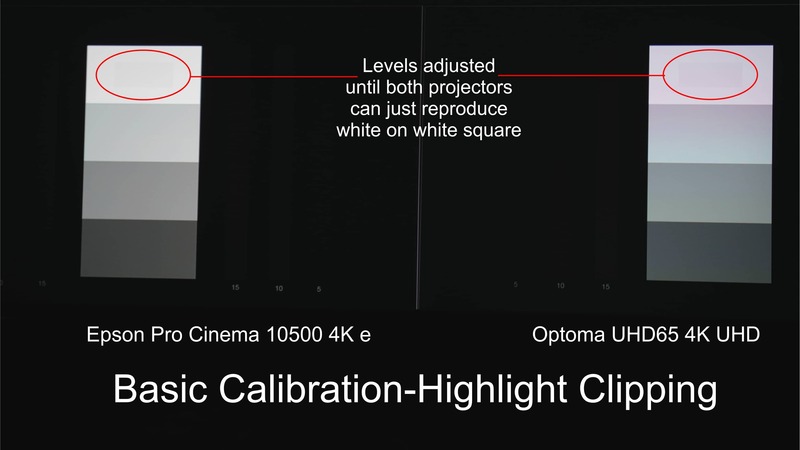 In addition, we tested two different Optoma UHD655‘s and two Epson 4k enhanced projectors. The difference was always the same – true UHD 4K is simply better and more detailed. Notice the difference in the actual visible stars and the detail in the earth and clouds. The Optoma does not disappoint. Also, notice the slightly out-of-focus 3840 image of the Optoma compared to the Epson, which is in the center of the wide angle photo at top. Even though the Optoma appears to be slightly out of focus in this image, it is still much more detailed than the Epson on good 4K material. It is always interesting to see how brightness compares when projectors are put in their best color mode. Depending on the technology used for the image reproduction, overall brightness can drop by as much as 50% or more. The Epson Pro Cinema LS10500 above is rated at 1,300 lumens, whereas the Optoma is rated at 2,200 lumens. In these comparisons both projectors where in their brightest lamp mode and best, or as close to best as possible, color mode, with non technical calibration and used only basic test signals. Both projectors were very close to each other for brightness, as can be seen in the side-by-side off-screen photos above. Even though both can come very close to their rated output in other color mode settings, in good color settings neither projector has a significant advantage in terms of overall brightness. Both appear to be very close to about 1,000 lumens, which is ideal for a home theater screen up to about 105″ to 110″. So which is better overall? It may depend on your application and viewing distance. The Epson, being laser-based, has no lamps to replace and is much better visually to HD or full 1080p projectors. It will accept 4K UHD signals and display them with very high quality. The Optoma, however, will produce a more detailed and sharper looking image for most viewers at less than 1/3 the cost. We are impressed – the Optoma is a true break through projector in terms of performance and cost. 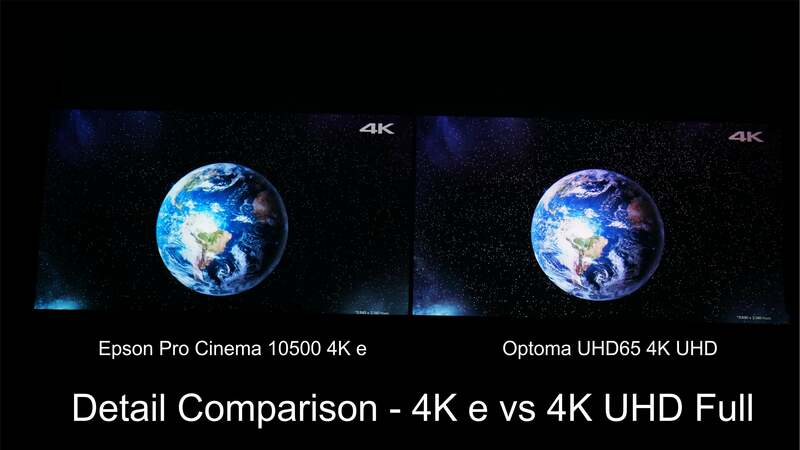 It is a significant step forward in cost affordable 4K projectors. See our review on YouTube! This entry was posted in AV Solutions, Home Theater and tagged 4k, 4k enhanced, 4k Enhancement, 4k enhancement technology, brightness, Color comparison, detail comparison, Epson LS 10500, Epson LS10500, Epson Pro Cinema LS10500, Epson Pro Cinema Projector, LS10500, Optoma Projector, Optoma UHD65, projector, projector comparison, projector comparisons, Projectors, skin tone comparison, UHD, UHD65, Ultra High Definition.